Are Pet Stains &Pet Odors Becoming More Than You Can Handle? We know you love your pets… we love ours too! But let’s face it, PET ACCIDENTS HAPPEN! Even the most well-trained pets sometimes have an accident – and that accident often happens on your carpet or area rugs. One of the most difficult cleaning situations a homeowner can encounter is the challenge of removing pet stains and odors from carpet, area rugs and furniture. Many people will attempt solve the problem themselves, only to find that their efforts have helped (maybe) – but not completely resolved the issue. This is where our pet stain and odor removal carpet cleaning service comes into play.We have a unique system to treat all types of pet stains & odors. For minor pet odor problems, our normal truck mounted deep steam cleaning process may be all that is needed. For moderate odors, we offer a safe buteffective Surface-Odor-Treatment . 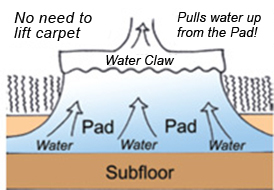 In more severe cases, the urine sometimes soaks through the carpet backing the padding and floor beneath. In this case, the problem has become “multi-layered” and effective remediation must address each layer of the problem. 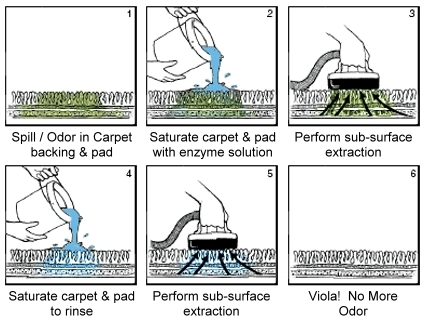 Preferred Carpet Care has developed a specialized “Enzyme-Flush-N-Rinse” method from removing these difficult pet odors. Treatment options:Depending on the situation, 1 or both treatments can be used. This option is designed to treat just the surface and a little below. It does not reach deep down therefore,odors deep down may still remain after this treatment. However, it can significantly help reduce the strengthof the odor, if it can’t completely eliminate it. and reaches the sub-floor. If our solution is able to make contact with the odor source, it will eliminate it. After sufficient dwell time for the enzyme we rinse &extract the affected area using a special sub-floor tool (called the Water claw) connected to our truck mounted equipment to remove urine and solution from the carpet padding up. Note: This treatment is not designed to be performed on an entire room. It’s ideal for 1-5 small areas. 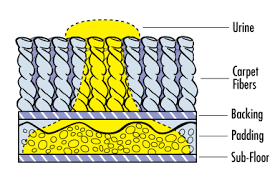 For more areas, our Surface-Odor-Treatment should be considered as a single treatment or as a combined treatment. 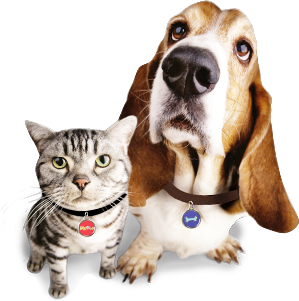 We are happy to discuss your pet stain and odor problems, and will try to provide the most effective treatment possible. Be aware no company can guarantee 100% removal of pet stains and odors, and if they do, be very wary. We are very proud of our high success rate of removing pet stains and odors, and are confident that if anyone can help, it will be us! We find that even in cases where 100% removal isn’t possible, that we dramatically decrease the negative effects of the pet odors & stains! If we think that your case is so severe that we can’t help, we tell you that, too! And please, don’t be embarrassed–we’ve seen it all and understand this natural “side effect” that comes along with owning a pet! Call us today for a FREE estimate. We’ll give you an honest, professional opinion of what it will cost to get the job done right.